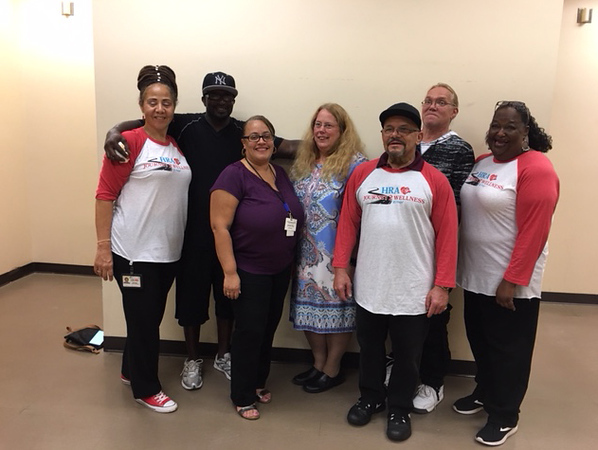 BRISTOL - Curtis began taking his medication regularly after he attended the Journey 2 Wellness support program sponsored by the New Britain and Bristol Human Resources Agency. A woman said she is learning to live again thanks to the group after receiving what she thought was a death sentence when she was diagnosed with HIV years ago. Mary contracted HIV from a needle in her job as a nurse at a rehab center 38 years ago. “Because I found HRA, my life is a whole lot better,” she said. For about a year and a half, HRA in both cities have been providing people dealing with HIV and AIDS support in a way that previously didn’t exist. The HRA provides services for people in Bristol, New Britain, Burlington, Farmington, Plainville and Plymouth. Members of the communities living with HIV and AIDS were invited Wednesday to come to the HRA Bristol office at 55 South St. to learn about Journey 2 Wellness during a networking event that included lunch and a chance to learn more about what the support group provides. Through the Journey 2 Wellness program, four times a month, people can attend a support group led by peers also living with HIV and AIDS to receive valuable information on accessing medical care, how to properly deal with medication, the importance of health screenings such as mammograms, and the availability of a host of other services. The groups also provide emotional support for people who often don’t have family or feel like they can’t reveal their diagnosis, organizers said. “There’s a lot of power in the groups,” said Journey 2 Wellness psycho-social coordinator Valerie Ingram, who works for the New Britain HRA. “There’s a strength, sometimes we cry, sometimes we laugh, sometimes we yell. One of the biggest hurdles people face is the stigma attached to an HIV positive diagnosis, or a diagnosis of AIDS, said Alice Ferguson, a longtime AIDS survivor who also leads a Journey 2 Wellness group. Ferguson said she noticed while volunteering at the recent Rockwell Summer Festival that people seemed to struggle with coming over to the Bristol Mayor’s Task Force on HIV and AIDS booth to get information. “They seemed hesitant to come forward, “ she said. She encourages anyone dealing with the diagnosis to come to the meetings. Until Curtis started attending, he wasn’t taking his medication, he said. He’s also learned how to better manage his anger. His involvement and his activism for those with AIDS isn’t about himself, Curtis said. “It’s about the people coming after me,” he said. For more information on Journey 2 Wellness, contact Ingram at 860-826-4741, ext. 2803 or vingram@hranbct.org. Posted in The Bristol Press, Bristol on Wednesday, 22 August 2018 20:27. Updated: Wednesday, 22 August 2018 20:30.